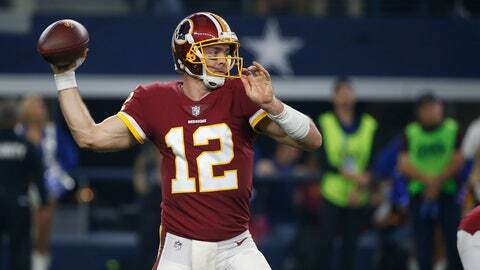 ARLINGTON, Texas (AP) — Colt McCoy still hasn’t had a single rep in practice with Washington’s first-team offense this season. That will finally come after his first NFL start in nearly four years. After Alex Smith’s gruesome leg injury only four days earlier, and a short week to prepare for a Thanksgiving Day game in his home state, McCoy threw for 268 yards and two touchdowns Thursday. But he also tossed three interceptions in a 31-23 loss at Dallas that let the Cowboys tie the Redskins for the NFC East lead. The Redskins (6-5) had a 13-10 lead after McCoy threw his second TD pass, a 10-yarder to Trey Quinn in the third quarter. But that lead was gone after Dak Prescott’s touchdown passes of 40 and 90 yards to Amari Cooper in a span of less than five minutes later in the period. Weeks before his previous start in December 2014, McCoy’s last NFL victory came in another road game against the Cowboys — a 20-17 overtime win on Oct. 27, 2014, when he was 25-of-30 passing for 299 yards. In his only other previous game at AT&T Stadium, McCoy was the quarterback for Texas in a win over Nebraska in the 2009 Big 12 championship game. The Redskins and McCoy have some extra time to get ready for their next game, a week from Monday at Philadelphia. “I think it’ll help. I think it’ll help me, but I think it will help everybody,” McCoy said. Now in his fifth season as Washington’s backup quarterback, McCoy had only appeared in four games for the Redskins before Thursday. That included replacing Smith in the third quarter of Sunday’s 23-21 loss to Houston. A potential winning drive stalled near midfield, and Dustin Hopkins‘ 63-yard field goal try fell short with 3 seconds left. McCoy looked as if he hadn’t started a game in a long time early against the Cowboys, throwing into double coverage on his first play. He fumbled while trying to scramble on his third, but Washington recovered. But McCoy settled in with a couple of third-down passes to Jordan Reed to keep drives going, then hit Vernon Davis in stride on a 53-yard touchdown — the longest Washington completion of the season — for a 7-7 tie. Gruden said the Redskins didn’t have to change how they called plays and should be better with the upcoming practice — and McCoy getting first-team snaps in practice for the first time since summer workouts.